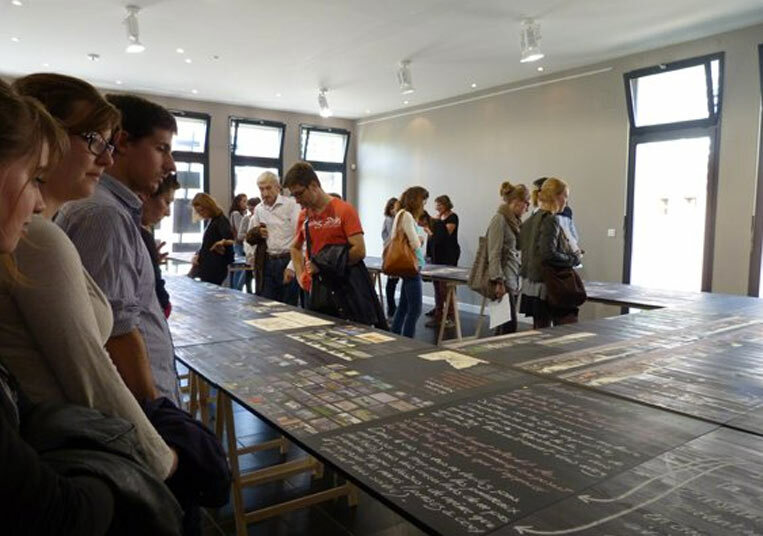 The Studio of Calligraphy presented by Bakélite, global and solid design, as part of Civic City’s project in Nègrepelisse, September 15, 2013. © La cuisine, Center of Art and Design. When a community seeks to transform itself in the face of a challenge, it can be difficult to organize a response that satisfies everyone involved and stills feels true to the place. Creative placemaking is an inclusive approach that uses art and design as a catalyst to help communities regenerate themselves. Partners from public, private, non-profit and community sectors collaborate to shape the physical or social character of their town, neighborhood or city. The resulting project may take the form of a cultural activity, the regeneration of buildings or streetscapes, or the development of a new landmark or destination. Often the process involves the creation of a story or narrative that expresses the unique quality of a place, and begins with a simple question: What would you like to change about your community? Opening of the exhibition “Imaginer Nègrepelisse ! Jardiner ensemble l’écrit de La ville” by Civic City, September 21, 2013. © La cuisine, Center of Art and Design. At its largest, creative placemaking may involve entire towns and cities. The graphic designer Ruedi Baur is a pioneer in the field who, in addition to designing identity and signage systems at his studio Integral Ruedi Baur, also runs an urban research program called Civic City that helps citizens transform their cities through design, often using environmental graphics and the written word. 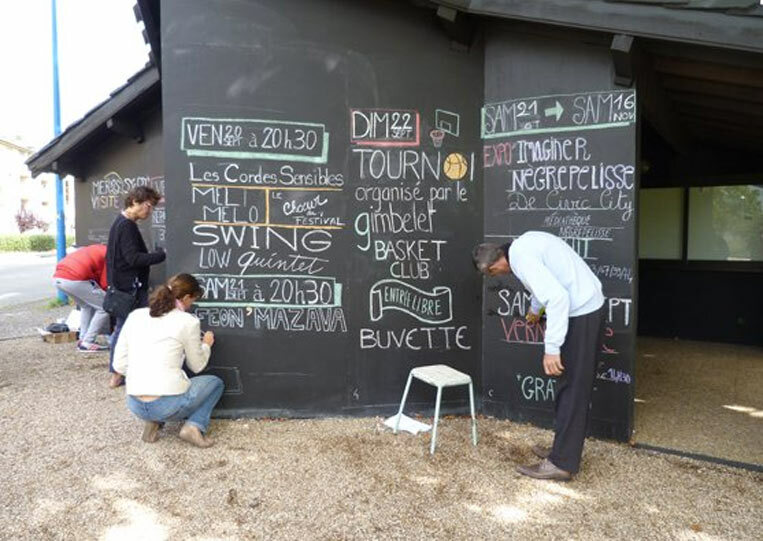 In one of the lab’s recent projects, workshops were conducted with the residents of Nègrepelisse, France, to see what would happen if, in lieu of posters and prefabricated signs, people were encouraged to share information with each other in the form of handwritten messages in the city’s parks and gardens. Written on walls, benches and other structures, the shared communications were carefully “grown” and tended like the city’s green spaces, fostering a greater sense of community that was inherently natural. Placemaking projects may also be developed on a smaller scale, focusing on a single location to make an impact. 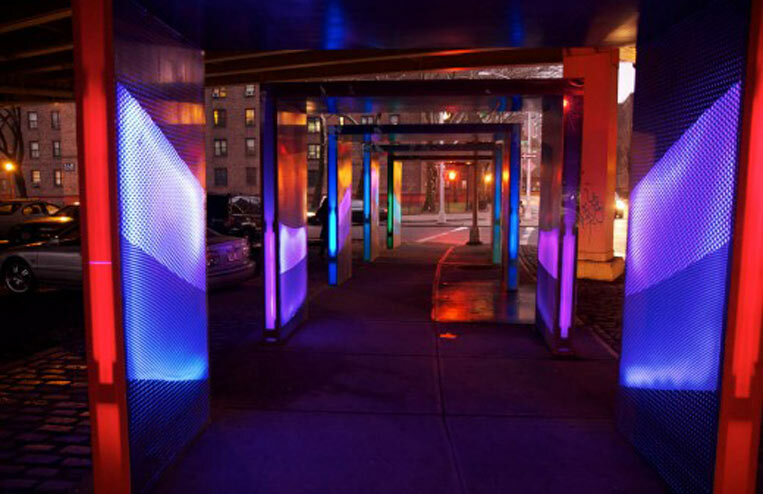 Completed this past December, Silent Lights is a public art installation by Artist Build Collaborative that places a set of six illuminated gates at a dark underpass of the Brooklyn Queens Expressway at the junction of Downtown Brooklyn, Dumbo and Fort Greene. The gates respond to their environment by changing color and patterns according to surrounding sounds. To develop the project, the artists attended meetings of local Community Board 2 and consulted with area constituents including residents of the nearby Ingersoll Houses. They also signed on support from the Myrtle Avenue Brooklyn Partnership (the local Business Improvement District) and received early recognition from the Design Trust for Public Space. The finished gates offer a friendly intervention in a forbidding, forgotten corner of the city—a colorful, human-scaled underpass under the scary rumble of the BQE. They are especially welcome this time of year, when children pass under them on their way to school on cold, dark mornings and home again in the evenings. “People seem pleased that someone had decided to beautify a place that was never considered for art before,” the artists noted in their summary of the project. Public events are another successful strategy for placemaking and especially effective for engaging multiple levels of a community. 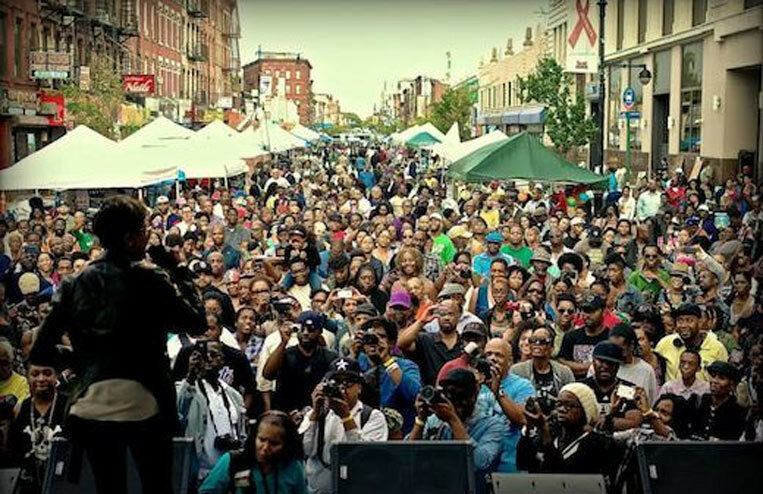 Since 2012, The Museum of Contemporary African Diasporan Arts (MoCADA) has hosted the Soul of Brooklyn block parties, a series of roving monthly events presented in different neighborhoods throughout central Brooklyn. The popular gatherings have attracted a devoted following with a lively mix of music, food and shopping, successfully promoting the work of 32 African Diaspora arts organizations, 10 area business districts, and over 40 small businesses in the process. The parties bring together arts programming and local entrepreneurs to boost the area’s economy and help brand Brooklyn as a creative community as a whole. Both Silent Lights and the Soul of Brooklyn have received funding from ArtPlace America, a collaboration of foundations and banks that has the mission of using art and culture to transform communities. ArtPlace America has also awarded a grant to AIGA/NY Design/Relief, an initiative to aid three New York neighborhoods extensively damaged by Hurricane Sandy: the South Street Seaport in Manhattan, Red Hook in Brooklyn, and the Rockaways in Queens. The first of these has just opened at the South Street Seaport. 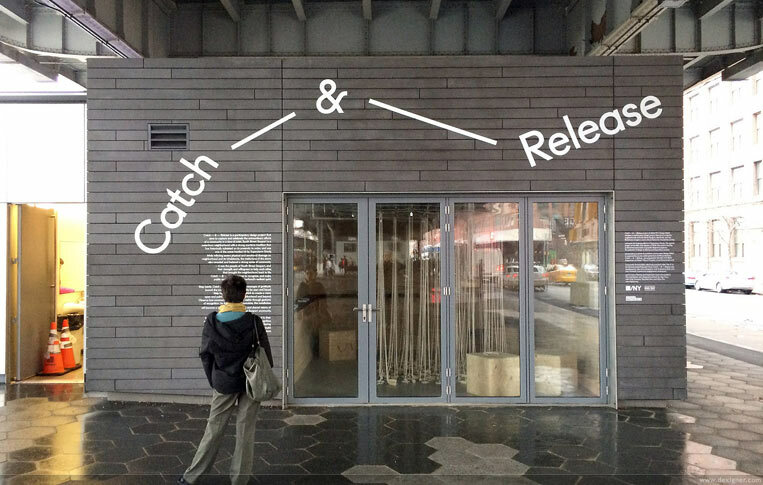 Called Catch—&—Release, the installation invites people to leave their thoughts in written notes (the “catch”) to be shared with the community at a public ceremony later this month (the “release”). Developed by the designer Yeju Choi, with Francesca Birks and Josh Treuhaft of ARUP as strategists and Cristian Fleming and Stephanie Lukito of The Public Society as storytellers, the project is designed to build a public dialogue about the future of the area. The notes are hooked and hung on a network of ropes and pulleys, a playful nod to the Seaport’s history as a maritime center and a symbol of the connection the project is meant to engender. The installation is open through March, and the collected statements will help inform future phases of the project. We’re currently working on the Design/Relief response for Red Hook, Brooklyn. Our partners on the project are the studio MGMT. design, the strategists Amplifier Project, and the communications specialist David Al-Ibrahim. We’re excited to be collaborating with the community to create something new—and hopefully lasting—that will preserve and enhance its unique sense of place. Our project launches in early May and we’re eager to share the results. Stay tuned for updates! Magnificent website. Plenty of helpful info here. I’m sending it to a few pals ans also sharing in delicious. And obviously, thank you on your sweat!